Hurricane Gustav is now a very dangerous Category 4 hurricane threatening western Cuba, and is expected to reemerge in the Gulf possibly reaching Category 5 strength, the most powerful type of hurricane. 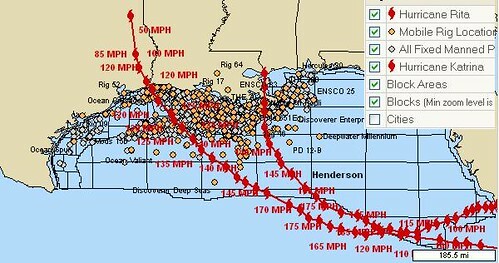 While it is still uncertain whether the hurricane will impact the U.S. Gulf coast, two models for example have shown Gustav turning away to the West before landfall, all models agree that the important Gulf oil rigs are seriously threatened. Significant damage to the oil rigs could send oil and fuel prices skyrocketing again. A serious oil spill could impact the U.S. presidential debate on new offshore oil drilling that has captured headlines recently during the campaign. In addition to hurricane damage, Gustav may stall over Louisiana and/or Texas causing major flooding problems. Folks in New Orleans and other parts of Louisiana are taking no chances. Mass evacuations are currently underway.